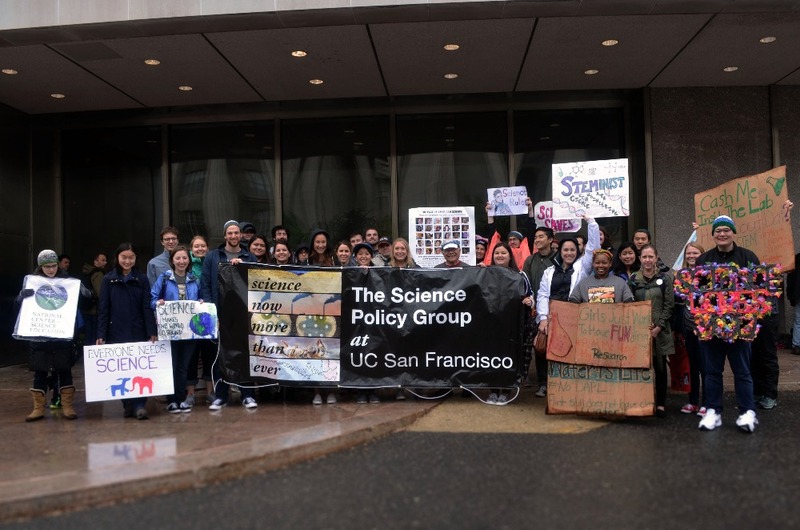 We are members of the UCSF Science Policy Group -a registered campus organization (RCO) dedicated to educating our students and postdocs about science policy issues as well as taking action to support science advocacy. We are a special interest group made up of students and postdocs at UCSF. This march and fundraiser directly aligns with our mission as a science policy group. Being political is part of our mission and we are interested in political/policy careers. In light of the current administration's documented anti-science and anti-immigration policies (both of which dramatically effect the scientific enterprise), we decided that it was important to send early-career scientists to Washington, D.C., to participate in the March for Science, and to use the trip as an opportunity to coordinate with other science policy organizations to meet with legislators to discuss the critical importance of sustained research funding, and to explain the importance of bringing scientific perspectives to a range of policy issues. Science is the eternal quest for truth - a burning curiosity that has brought us astronomy, an ebola vaccine, cars, planes, trains, GPS technology, cell phones, computers, transistors, outer space, cures for common diseases that were once death sentences, and a dramatically increased quality of life! Knowledge is power. Knowledge is investing in the future, and any short-sighted wish to throttle this (largely federally-funded) information pipeline is a formula for disaster. So, please - help us stand up for our collective future - by supporting our efforts to stand up for science and march on washington! What is our relationship to the parties we are raising funds for? We are raising funds to send students and postdocs in the Science Policy Group at UCSF to Washington DC. Who will withdraw the funds? Samantha Ancona Esslemann, a UCSF graduate student and the manager of this campaign, will withdraw the funds into her personal bank account, with oversight and accountability from the UCSF Graduate Division Office. She will keep a careful accounting of how the funds are used. If you would like a summary of how the funds were used, please contact us! How will these funds be spent? We will use these funds to pay for airfare for as many students as possible to Washington, D.C. We are looking for existing connections and friends in Washington DC to host scientists so we can use funds exclusively for airfare, when possible. We will allocate $600 per scientist selected to travel. These funds will not be used for: food, travel once in DC, alcohol, other. See updates for additional information about the trip, including tentative schedules. In light of recent feedback about our campaign, we have decreased our goal amount, we have tightened up and clarified our mission, and we have engaged in a productive discussion within the group about how to respect the concerns while continuing to pursue our goals. That said, we will emphasize that we will work hard to send a diverse group of students and postdocs to advocate. There is a lack of diversity in STEM fields that's caused by compounding factors, one of which is a broken education system. According to the U.S. Department of Education, African Americans received 7.6% of all STEM bachelor's degrees and 4.5% of doctorates in STEM. Only 6% of STEM workers are African American. Similarly, less than 2% of STEM workers are Hispanic. Furthermore, African American students show an initial interest in STEM as freshman in college but switch from a STEM major to a non-STEM major at a high rate. This is unacceptable and we are marching for better STEM education for people of color, in order to further the diversity in STEM fields. Disclaimer: The views expressed in this post and on our introduction video are our own and do not represent the University of California. Thank you so much for donating to our campaign to attend the DC March for Science! We were able to bring 33 UCSF PhD students to D.C. to participate in the march for science because of your generous contribution. We are overwhelmed by all the support we received for this effort - your incredible generosity made this trip free and accessible to all students. 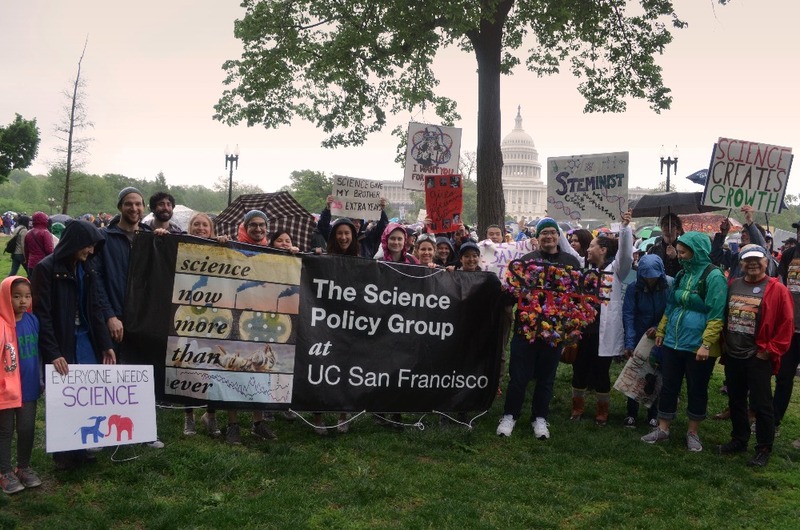 On Saturday, April 22nd, we all attended the March for Science rally and then marched together in DC under a UCSF banner. 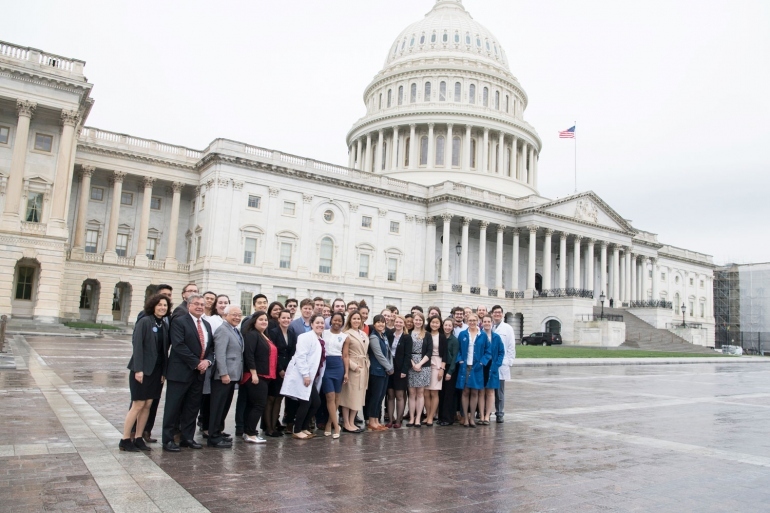 On the following Monday, we were joined by UCSF professors to engage in a UCSF advocacy day on Capitol Hill where we visited congressional offices to share our research and training experience. Since we had 33 students participating, we were able to break into small groups and visit 19 house and senate offices, where we discussed a variety of policy issues that are important to the scientific community, including NSF/NIH funding, STEM education, and diversity. For most of us this was our first trip to Capitol Hill and an invaluable learning experience. Meeting with congressional offices showed us just how crucial advocacy is to maintaining and improving the scientific research enterprise and gave us excellent practice for what we see as only the beginning of our advocacy efforts. Thank you for making this trip possible and helping us to stand up for science! We are forever grateful. As the movement behind the March for Science continues to grow, the Science Policy Group is evolving in how we can effectively contribute to the movement and fight for a multitude of issues in the sciences, such as lack of diversity, decreased federal funding, and the need to promote STEM in primary and secondary education, etc. We have received an outpouring of support and ideas from individuals and organizations that have helped us reaffirm our role as an advocacy organization, as well as organize opportunities to meet with legislators while in D.C. The discussions helped galvanize our group to make the most out of this trip. Foremost, we would like to reaffirm that our fundraiser to send young scientists to the D.C. March for Science directly aligns with our mission as a special interest group focused on science policy. Part of our mission is to provide young scientists in the UC system with opportunities to learn how to advocate for science on the national and local level, to legislators and the voting public. We are preparing graduate students and postdoctoral level scientists for careers in science policy, because scientists must be engaged in policy. We will send a diverse group of scientists, not only to march, but also to meet with representatives to discuss the following: sustained and consistent funding, health policy, environmental policy, diversity in STEM education and careers, and immigration issues (more than half of postdocs are non-citizens). In addition, this is a learning experience in which scientists will be exposed to the political process; this is a useful and powerful endeavor, especially in light of this administration that rejects evidence-based decision making. More than ever, we need scientists equipped to help mold how decisions are made in D.C.
As graduate students and postdoctoral fellows, often the only contribution that we can make to our community is our time rather than money, which is why we are asking for financial help in order for us to donate our time. Here is our very tentative schedule (much planning and scheduling is happening very quickly, as we only recently learned the date for the march). Sunday: Craft our elevator pitches and our specific messaging to legislators with whom we will meet later in the week. Monday and Tuesday: We will meet with other organizations participating in the Congressional Visits Day (SETCVD) to learn advocacy tips and tricks, and to discuss how this messaging might be different with the new administration. Wednesday: We will team up with students from other science policy groups at other universities to speak with legislators or their staffers on capitol hill. In the past, we have been able to schedule a series of meetings (between 5-8 meetings) that start at 9:30 or 10:00 am and continue until legislators leave their offices in the afternoon. We do not anticipate this being any different this year, and the more students that are funded to come on this trip, the more offices we can target. In these visits, the science policy members learn a great deal about lobbying, advocacy, and the legislative process. We are excited that we are able to pair this advocacy day with the March for Science. We march for diversity in STEM fields and STEM education. The lack of diversity in STEM fields is caused by compounding factors, one of which is a broken education system. According to the U.S. Department of Education, African Americans received 7.6% of all STEM bachelor's degrees and 4.5% of doctorates in STEM. Only 6% of STEM workers are African American. Similarly, less than 2% of STEM workers are Hispanic. Furthermore, African American students show an initial interest in STEM as freshman in college but switch from a STEM major to a non-STEM major at a high rate. This is unacceptable and we are marching for better STEM education for people of color, in order to further the diversity in STEM fields. Dear Dorothy Zbornak, Thank you for raising your concerns. We hear you and we have worked hard over the past day and a half to clarify our goals, and we have decreased our goal amount as we recognize that our "pie-in-the-sky" target was unrealistic and that the optics were unfavorable given recent events. Additionally, we removed our video from social media, as it may appear insensitive without the full context of the description on our gofundme campaign. Perhaps most importantly, we have engaged in a productive discussion within the group about how to respect and address your concerns while continuing to pursue our goals as a special interest student organization. Please see our statement on the group's Facebook page. I have also copied the statement below in this comment: "As the movement behind the March for Science continues to grow, the Science Policy Group is evolving in how we can effectively contribute to the movement and fight for a multitude of issues in the sciences, such as lack of diversity, decreased federal funding, and the need to promote STEM in primary and secondary education, etc. We have received an outpouring of support and ideas from individuals and organizations that have helped us reaffirm our role as an advocacy organization, as well as organize opportunities to meet with legislators while in D.C. The discussions helped galvanize our group to make the most out of this trip. Foremost, we would like to reaffirm that our fundraiser to send young scientists to the D.C. March for Science directly aligns with our mission as a special interest group focused on science policy. Part of our mission is to provide young scientists in the UC system with opportunities to learn how to advocate for science on the national and local level, to legislators and the voting public. We are preparing graduate students and postdoctoral level scientists for careers in science policy, because scientists must be engaged in policy. We will send a diverse group of scientists, not only to march, but also to meet with representatives to discuss the following: sustained and consistent funding, health policy, environmental policy, diversity in STEM education and careers, and immigration issues (more than half of postdocs are non-citizens). In addition, this is a learning experience in which scientists will be exposed to the political process; this is a useful and powerful endeavor, especially in light of this administration that rejects evidence-based decision making. More than ever, we need scientists equipped to help mold how decisions are made in D.C. As graduate students and postdoctoral fellows, often the only contribution that we can make to our community is our time rather than money, which is why we are asking for financial help in order for us to donate our time. Here is our very tentative schedule (much planning and scheduling is happening very quickly, as we only recently learned the date for the march). Saturday: March for science Sunday: Craft our elevator pitches and our specific messaging to legislators with whom we will meet later in the week. Monday and Tuesday: We will meet with other organizations participating in the Congressional Visits Day (SETCVD) to learn advocacy tips and tricks, and to discuss how this messaging might be different with the new administration. Wednesday: We will team up with students from other science policy groups at other universities to speak with legislators or their staffers on capitol hill. In the past, we have been able to schedule a series of meetings (between 5-8 meetings) that start at 9:30 or 10:00 am and continue until legislators leave their offices in the afternoon. We do not anticipate this being any different this year, and the more students that are funded to come on this trip, the more offices we can target. In these visits, the science policy members learn a great deal about lobbying, advocacy, and the legislative process. We are excited that we are able to pair this advocacy day with the March for Science. Sincerely, The Science Policy Group A UCSF Graduate Student Organization"
This campaign is tone-deaf, and you should all be embarrassed that you willingly attached your names to this. •	You want to raise $20,000 so you can go to Washington D.C. to march. Why not raise that money to fund an organization that could really use it, like Jr.Tech, Project Exploration, UCSF’s own Diversity Fund (http://medschool.ucsf.edu/deans-diversity-fund), or literally one of the hundreds of other great nonprofits that help advance scientific education and defend the right for scientific research? •	Why not go to the Bay Area March for Science? Planning for that is already well underway. Have you considered helping make this one bigger and better? What about helping low-income Northern Californians who care about science travel to the march? •	You do know how much the average public high school science teacher makes, right? And that $20,000 is a significant percentage of that figure? How about you send this fundraising link to a public-school science teacher that’s spending their own money to purchase classroom supplies, and see how they react. Would you like some names of those teachers in need? How about you literally look up every public-school science teacher in the country, and figure out where to start. •	While I acknowledge there’s no way to know your ethnic and cultural backgrounds, you all appear to be white. The immediate reaction I had was “oh, so a bunch of well-educated white people want people to pay for them to take a fun trip to D.C.” Optics count, especially right now. I was embarrassed just watching your video, and I’m not even in it. Recognize your privilege, and then fight against it. Don’t soli •	“We will use this trip as an opportunity to meet with elected representatives or their staffers to discuss their plans to stand up for science.” You do know your elected representatives have local offices too, right? And that there’s no guarantee that you’ll be able to meet with these people on the date you’re interested in, especially considering you’re there on a weekend? Plus, no names, no confirmed meetings scheduled, just an abstract promise that this is totally going to happen. Please, please take this down and refund the money, before this goes viral and you become the newest face of Silicon Valley ignorance. Rock on Science Matters Marchers! !